In a world where renewable energy sources has become increasingly important, many have turned to the vast oceans as a source of power. As winds sweep across the ocean, they apply a force to the water at the surface. As the water is pushed one direction or the other, it creates waves. The energy contained in waves is clearly illustrated by the destruction that can be caused by tsunami's as well as the continuous erosion of coastlines. 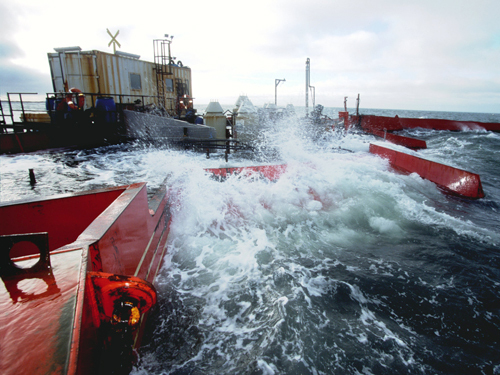 Although, not all of the potential sites for wave energy capture can be utilized (because of shipping lanes, fisheries, sensitive habitats, etc), there is still ample energy available to support our needs. 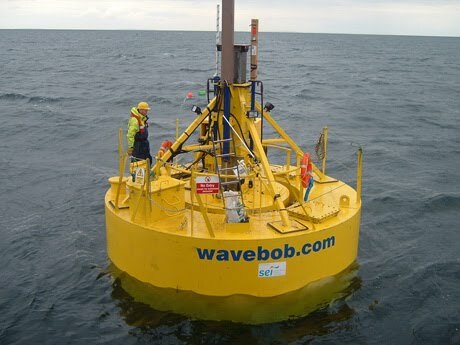 The Electrical Power Research Institute (EPRI) conducted a study which estimated that the total amount of wave energy available along the outer shelf of the U.S. is around 1,170 TWh/year. To put this in perspective, the entire U.S. uses a total of about 4,000 TWh annually. See the full EPRI report here. These devices are typically situated perpendicular to the direction of the waves in order to utilize the vertical movement of the surface of the water. In a oscillating water column device, waves push water through an opening below the surface of the device. As the water level within the device rise, the air inside the chamber is compressed and forced out of a turbine to generate electrical power. Oscillating water column devices are most often found on shorelines, but floating systems have been produced as well. Attenuators are long, segmented devices that lie parallel to the direction of the waves. As a wave passes by, different segments are raised and lowered. The motion between segments at differing heights is used to drive hydraulic pumps or some type of converter which can then generate electricity. These devices use the vertical movement of a floating component to either compress a fluid through a turbine, causing rotational motion that can be used for generation of electricity. They are typically more compact than other devices, and require some component to be stationary (mounted to the seafloor) while a complimentary component moves due to the waves. These devices have a reservoir that is filled by incoming waves. As the waves pile up, the water level in the reservoir increases, increasing it's potential energy. Much in the same way that a dam on a river does, the water in the reservoir is released through a turbine, and as it flows down into the surrounding water it generates electricity. Source: (Bureau of Ocean Energy Management). Thumbnail: the 300 kW 'SeaFlow' turbine off the north coast of Devon. Image used with permission (CC BY-SA 3.0 Unported; Fundy).